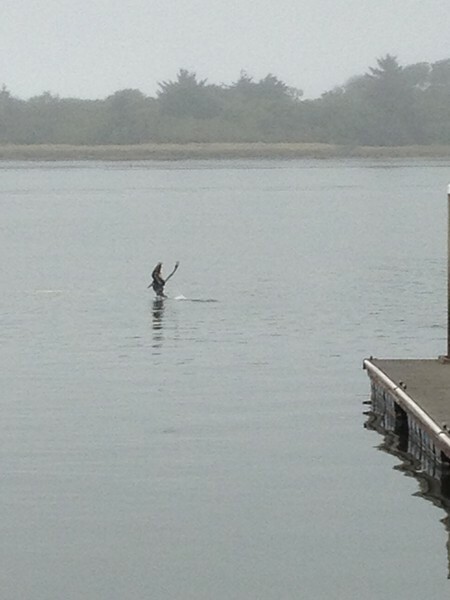 Yes, that's a pelican, caught mid-crazy-dive at the Eureka public marina. Remember last year how the Humboldt Wildlife Care Center, in Bayside, was inundated with sick pelicans? Most slick with oil from their ill-fated rummaging in fish-waste-Dumpsters, a few with fish skeletons lodged in their elegant throats? And the year before, same story, sick pelicans galore? Well this year, so far, the care center has had no pelican patients. None. And that's actually a little creepy, says Monte Merrick, who works there and with Bird Ally X. "It's very unusual," he writes in an email to the Journal. "The absence of pelicans is kind of alarming ... still waiting to hear how the breeding year went down south, but my hunch is quite poorly, especially after the sea lion pup 'unusual mortality event' earlier this year. They eat the same fish, sardines and anchovies." Bird Ally X has just released its final report on last year's fish-waste contamination of pelicans. You can read it on the group's blog. Even without pelicans, the care center still has been exhaustingly busy with other critters, says Merrick, including "TONS of baby mammals." Here's the rest of the tally, to date: 25 raccoons; 19 opossums (eight of them just released from care); two gray fox kits; one coyote; one squirrel; four skunks; six deer; and an assortment of birds, young and old.